Early in Men in Black 3, Emma Thompson — who plays Agent O — delivers a eulogy for Zed, a character played in the previous movies by Rip Torn. Claiming that she’s paraphrasing an alien, O speaks in a bizarre, screeching language that gives new meaning to the word “shrill.” Thompson’s offbeat moment marks one of many amusing bits in director Barry Sonnefeld’s often imaginative reprise of a series that began in 1997. 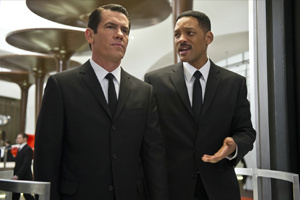 Men In Black 3, available in 3-D, boasts a high degree of creativity, a serviceable enough story and the expected bickering between agents K and J (Tommy Lee Jones and Will Smith). The movie may not score a bull’s-eye, but it’s no dud, either. The first Men in Black movie caught audiences by surprise. Released in 2002, the second didn’t do much for me and most other critics, but sold a fair number of tickets. The third is ... well ... a bit of a conundrum. What I liked about No. 3, I tended to like a lot, but sporadic enjoyment doesn’t entirely compensate for the fact that the various pieces that Sonnenfeld has assembled don’t always translate into big-time fun. This edition involves time travel. In brief: Agent J travels back to 1969 to kill Boris the Animal (Jemaine Clement), an alien who has a plan for wiping out the Earth or conquering it or something. J’s arrival in 1969 allows Sonnefeld to do a few time-travel jokes, one revolving around J’s encounter with a couple of bigoted policeman. Despite such annoyances, J soon meets a younger version of Agent K. Enter Josh Brolin, who seems to have stolen Tommy Lee Jones’s voice, mastering Jones’s every clipped, sardonic inflection. I don’t know if Brolin’s giving a performance or a doing an impression. Whatever it is, it’s dead-on. For his part, Jones appears in the opening and closing scenes that bookend the main part of the movie. In short, he’s not required to do much heavy lifting, which is fine. I’m betting the always imposing Jones rather would have been elsewhere. In 1969, J also meets Griffin (Michael Stuhlbarg), a dithering alien who’s able to see a variety of versions of the future. J also learns a secret about himself, which adds a bit of unexpected poignancy to the story, which is credited to five writers. The multiple authorship sometimes shows. Men in Black 3 doesn’t seem to know where it’s headed. An opening sequence in a Chinese restaurant is funny in a downbeat sort of way. It also assembles an appropriately disgusting collection of alien life forms, including a giant alien fish about the size of a small tugboat. To travel through time, Agent J must leap off the Chrysler Building, a feat that gives Sonnenfeld an opportunity to apply some vertiginously effective 3-D, an opportunity that repeats itself during the movie’s finale, which takes place at Cape Canaveral, Fla.
A joke involving the late Andy Warhol (Bill Hader) doesn’t quite pay off, but the filmmakers deserve credit for advancing a novel explanation for Warhol’s strange personality. You get the idea: Men in Black 3 puts lots of ingredients in its bag and shakes them up to mixed effect. Smith sometimes works a little too hard to ignite an old spark, and there certainly was no pressing reason for anyone to revisit these characters. Having said that, Sonnefeld & company deserve mild praise for bringing a palatable version of an old favorite into the summer of 2012, where I hope the franchise finds its eternal rest after patting itself on the back for at least trying to hit some strangely amusing notes.